We’re always first to market with interesting new items and new organic, specialty and local products. 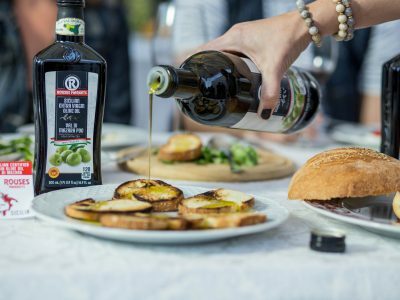 True Italians food lovers know, there’s extra-virgin olive oil, and then there’s olio novello. This is the first batch of oil made from 2018’s olive harvest. Italians line up to buy bottles the day they are released. Why all the fuss? The flavor. The olives are picked early, and pressed immediately, which preserves the flavor and aroma of the olive fruit. The oil is then bottled unfiltered, so it’s green and clear. This is truly the most flavorful of all olive oils. Serve it as a dip for bread, pour over salads, or use it to dress meats and fish, soups and grilled vegetables. Cold extracted, 100% Italian olive oil produced in West Central Sicily, Precisely Palermo Province and the Western Province of Agrigento. Made with Biancolilla, Cerasuola and Nocellara del Belice olives. Use in soups and on salads, grilled meats and fish, vegetables, pizza and bruschetta. Personally chosen on our recent buying trip to Italy. 100% Italian. Round, medium-sized, pale green olives with a crisp but tender bite and mild, buttery-sweet flavor. Personally chosen on our recent buying trip to Italy. Cold extracted in a simple pressing of premium Italian olives. 100% Italian olive oil. Use in soups and on salads, grilled meats and fish, vegetables, pizza and bruschetta. Personally chosen on our recent buying trip to Italy. Our new authentic Italian wood-fired pizza crust imported from Modena, Italy is made with Type 00 flour – the gold standard of pizza flours, plus water, salt, yeast and oil. ​Fresh in our Deli. Look for the easy-to-spot Eat Right with Rouses logo on more than 500 grocery items that have lower sodium, saturated fat, healthier fats, more fiber and less sugar.